It may look like everything's nice 'n' neat and in order but it was anything but. The smoker was out of fuel, I beheaded 3 bees, and I really MUST learn to stop blocking my own way out of the greenhouse. Moving to the front, I started removing unoccupied brood combs. (This is typical in late Winter, and and you can take advantage of this behavior in your hive management, to cull old black brood combs.) Our hive had seven combs from 2009 but three was all I dared take out. The propolis seals didn't "crack!" when I broke them, but even just stretching open the seals seemed to send more bees into the air. Remember, I'm inside a greenhouse, so the air becomes thick with confused bees. BB said I am a certified beekeeper, having remained calm even though my shirt was untucked, but I'm sure he meant I'm certifiable. To replace the 3 combs I did take out, I put in a new top bar with a small starter comb (maybe the size of a business card), the full, slightly undulating comb of honey, and the top bar from the comb that broke off. Now, I hadn't planned on giving them topbars that need to be built out. It just worked out that way. I'm not too worried about it, though. 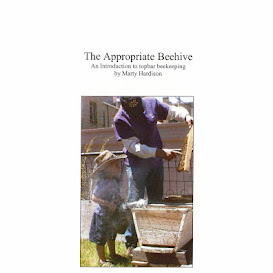 The brood nest was not opened, and the bees will easily be able to maintain the integrity of the cluster. I do feel bad that it was a very tight fit and I squished several bees. I really wanted to get back to the plan and move more honey from the back to the front, but the bees were getting pissed at this point. I made it all the way to the 8th comb and never made it to the brood nest. How an hour went by is beyond me, but there it is. It took me a long time to swap out 3 combs. I spent a lot of time just standing still, wishing the smoker would smoke, and waiting for the bees to stop giving me the evil eye. When I got to the point in the picture above, hive closed up and fewer bees in the air, I called it good even though nothing went as planned. I'll do better next time. I already moved the last of the '09ers closer to the end, so now we just wait for another 60°F day. March may be our snowiest month, but warm sunny days are always just around the corner in Colorado.